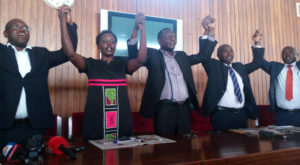 L-R: Wilfred Niwagaba (Ndorwa West), Monica Amoding (Kumi Woman), Felix Okot Ogong (Dokolo county), Theodore sekikubo (Lwemiyaga) and Barnabas Tinkasimire (Buyaga west). PML Daily photo. KAMPALA–The three NRM legislators and two independents fighting against the lifting of the Presidential age limit have been summoned to appear at the CID Police headquarters tomorrow. Police are accusing MPs Muhammed Nsereko, Theodore Ssekikubo, Banabas Tinkasimire, Felix Okot Ogong and Wilfred Niwagaba of inciting the public against Parliament. Last week, the legislators vowed to use any means to block any move by Parliament to amend Article 205(b) of the Constitution to lift the Presidential age limit. This was after some NRM MPs and some ministers convened and agreed to support the move to lift the age limit. If the legislators win the battle in Parliament, it means President Museveni will contest in 2021. Responding to the summons, Ssekikubo asked police to first arrest Evelyn Anite, the Koboko Municipality legislator, for trying to cause Constitutional disorder in the country by involving the army in partisan politics. “She threatened that they will use the army to crush those who are against their project. Before summoning us, I think they should hunt for Anite. The army is supposed to impartial,” Ssekikubo argued. Ssekikubo, however, is not sure whether they will appear before the CID Police. Lifting or not the age limit issue is becoming a contentious issue, almost dividing the public. Today, some religious leaders were prompted to show their stand on the matter. Forum for Democratic Change(FDC) plans to organise countrywide campaigns against the lifting of the age limit. At a press conference held at party office this morning, the party acting president, Alice Alaso, said they are working with changing forces to block Museveni from contesting in 2021.